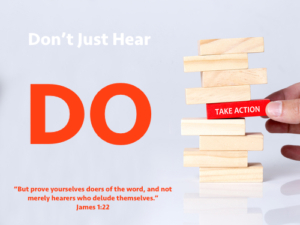 James 1:22 Don’t Just Hear, Do The Word! Am I merely a hearer of the Word? Or, am I a doer of the Word? We LOOKED at what we must ‘do’ to ‘receive’ the Word of God. Did you do what you needed to do to receive the Word in these verses of James? We will LOOK at what it means to ‘do‘ the Word of God. Oh Lord, as we come to meet with You forgive us for fresh sin this wk, even perhaps this morning. Remove anything that would get in the way of us hearing You today. Teach us and make known to us the way in which we are to walk and the work we are to do, (Exo 18:20). Go to GODcha and let it guide you today. We ended at verse 21, where James said we receive [embrace, follow] the implanted word in humility and purity. Now in verse 22, James begins with ‘But’. What are we not to be? Let’s unlock ‘prove’ and ‘doer of the Word’ that are Key to verse 22. Prove, gínomai, to become or to come into or bring into existence. To be found. And in this verse the idea is we are to continually become, be found, doers. NOTE: the Grammar for ‘prove‘ is a present imperative being a command that is a continuous lifestyle. Doer of the Word, poiēteâs, performer, to make something. A doer, keeper of a law or precept (Rom. 2:13; James 1:22, 23, 25; 4:11). NOTE: the Grammar for ‘doer of the Word’ is a present imperative being a command that is a continuous lifestyle. Hearer, akroateâs; In the NT, it has the meaning of one just listening without practicing what one hears. What are we commanded to ‘do’? What is true of one who is ‘merely a hearer’ of the Word? We see: The one who merely hears, but doesn’t obey, is kidding himself! Am I continually proving to be found a doer of the Word? Or, am I merely a hearer who doesn’t obey the Lord? Examine yourself as God speaks. 1. According to Joshua, what must we ‘do‘ to be doers of the Word? We see: We must meditate on the Word. THINK: What does it mean to meditate on the Word? It’s just a tap away. THINK: What is necessary to meditate (ponder, mutter, speak) on the Word and do it? We must be in the Word, learn it, and know it. Make this practical: As you go throughout your day, as circumstances arise, you think of and meditate on Scripture you know that applies to your attitude, words, and actions in those situations, and talk to God! Do I have a heart to do according to all that is written in it? 2. What is the result when we do the Word? THINK: What does success and prosperous mean? Success means to act with insight, wisely, to be prudent. Prosperous means you will accomplish satisfactorily what is intended. Understand: God enables success, victory, when we do what He says! Do I want: a prosperous way; success? How is meditating on the Word changing my life and enabling me success? Am I living a life of victory? Understand: The Jews were accustomed to hearing the Law read to them. We see: Paul is making the point that Jew or Gentile – one proves they are justified (declared righteous; right before God) by what they ‘do’. Understand: ‘Do’ would be to believe in Christ. We see: ‘Do’ then means to obey the Law! What am I doing that proves I am justified? Do others know I have been justified because of what I ‘do’? 3. What does it mean to be a doer of the Word? We see: To ‘do the Word’ is to OBEY the Word. Do I have a heart that wants to obey the Lord? Do I pick and choose what I want to obey? Am I a liar saying I know the Lord, but I do not obey Him? 4. What happens if we are NOT WILLING to be ‘a doer of His Word’? a. “Not everyone who says to Jesus, ‘Lord, Lord,’ will enter the kingdom of heaven, but he who does the will of My Father who is in heaven will enter. I can’t think of anything more sobering, frightening, serious and devastating to hear. We see: there will be MANY who are deceived about their eternal destiny. We see: there will be MANY who will be turned away from heaven because they did NOT do the Word. Will I enter heaven one day because I have done the will of the Father – bowed the knee to Jesus? Am I willing to do the will of the Father? Or, am I deceived about my eternal destiny? Do I say I believe? I say Lord, Lord, but practice lawlessness? Will I heed this warning and come to grips with my desperate condition? 5. What does Luke tell us Mary ‘did’? Understand: Listening means to hear with attention; to hear, perceive with the ears. To hear so as to perform what is spoken, to obey. Am I willing to do the one thing that is necessary? Am I willing to sit at the feet of Jesus, and listen intently? Is my desire to receive the Word? We must listen intently to the Word! We must meditate all day long on the Word. Our responsibility is not only to receive the Word of God, but to do it, obey it, put it into practice. Be blessed in what we do! In contrast to doers, there are Merely Hearers. This is very sobering and gives us much to meditate on. Reflect on the importance of God’s Word and doing it. Meditate on all you have seen and learned today. Remember this self examination is for our good! Talk to the Father who is a good God, desiring to bless you and grant you success! Suggestion: Record your findings also in Joshua and Romans. OH FATHER GOD, do not let any of us be deluded about ourselves, thinking that reading and hearing Your Word is enough. May we constantly desire to be with You like Mary, to enjoy sweet, precious time with You Lord Jesus! Jesus You are the Word that became flesh, and Father You speak to us through Your Son, (Joh 1:14); (Heb 1:2). 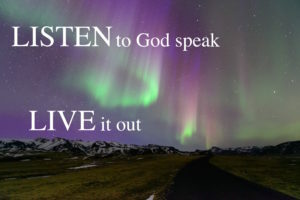 Give us ears to listen intently, to hear with the intent to do what You tell us to do! Please help us to stay in Your Word, to know it and meditate on it throughout the day at any given time for any given situation. May we live prosperous and successful live. You have commanded us to continually be found to be doers of the Word, not merely hearers! May we choose to obey You! We ask this in the precious name of our Lord and Savior, Jesus Christ. Amen! Meet you in a couple of days to LOOK @ James 1:26-27.
http://www.godcha.org/wp-content/uploads/logo-godcha-bible-guide.png 0 0 J Hamm http://www.godcha.org/wp-content/uploads/logo-godcha-bible-guide.png J Hamm2017-10-30 06:01:432019-03-19 11:27:04James 1:22 Don't Just Hear, Do The Word!